The guitar has a long, long history. So far back in fact, it’s really hard to tell who had the original idea. Back as far as the 13th century, people played instruments similar to the guitar, with different amounts of strings and different size bodies. The ancient Greeks, Egyptians, Arabs, and Northern Europeans were all known to play stringed instruments that don’t look too terribly different from what we play today. If you’re alive today, the guitar has been the main instrument of every band you’ve ever listened to. It’s had a profound impact on all American music in all genres, and it’s so popular, you probably have one laying around your house somewhere. We hope you enjoy learning about it! Here’s a bit more of the guitar’s history. There’s a few different types of guitars. This website helps you sort them all out. This website gives you a ton of guitar tabs and music news, just an all-around awesome guitar website. This website gives you a ton of free guitar lessons and some other great stuff. This game is like guitar hero, but you can play it on your computer, and it’s free. There’s a lot of ground to cover for the guitar, so here’s a couple hours of documentary. Here’s how an acoustic guitar is made! 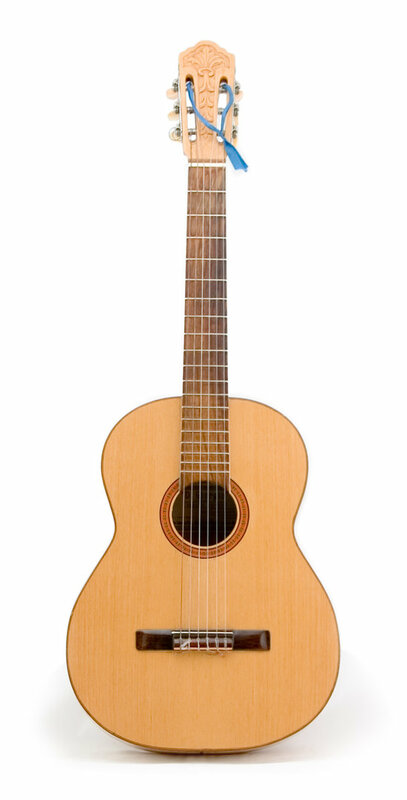 Here’s an 19th century French guitar. Great sound! Here’s 100 of the best guitar riffs in the history of Rock N Roll. Enjoy! This website gives you tabs to every single guitar chord known to man (and scales too!). The electric guitar is a bit different from the acoustic guitar. Here’s how they make electrics. Over the years, people have learned new and interesting ways to play the guitar. This talented guy gets pretty creative with how he handles his.